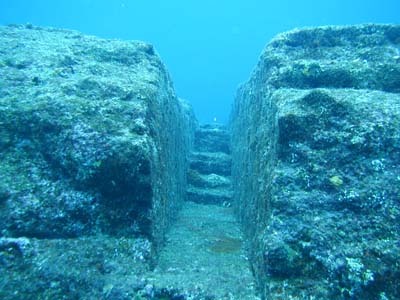 The Yonaguni Monument is a massive underwater rock formation off the coast of Yonaguni, the southernmost of the Ryukyu Islands, in Japan. While many archaeologists and geologists believe that it is a natural formation, some hold the view that some of its features are man-made. A mysterious undersea pyramid structure off the coast of Japan causes controversy - is this a natural geological phenomena or a man-made structure which changes the history books as we know them? 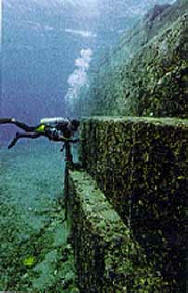 Others have estimated that the structure is far older – including Teruaki Ishii, professor of geology at Tokyo University who determined that the submergence occurred at the end of the last ice age – which was around ten thousand years ago (over twice as old as the pyramids in Egypt) – If this is the case, then our history books would have to be revised to take into account an advanced Eastern culture, more advanced than any early Western culture. 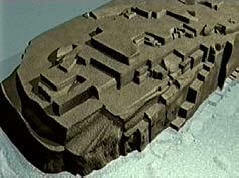 It is interesting to note that a number of tools have been discovered both on land and in the sea around the structures. 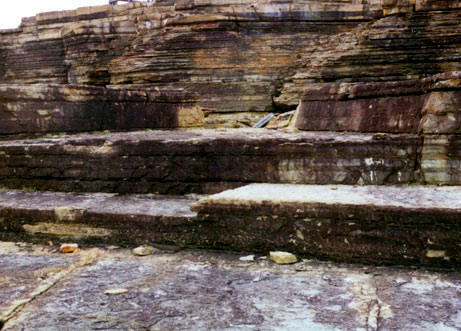 "I'm not convinced that any of the major features or structures are manmade steps or terraces, but that they're all natural,"
"It's basic geology and classic stratigraphy for sandstones, which tend to break along planes and give you these very straight edges, particularly in an area with lots of faults and tectonic activity." 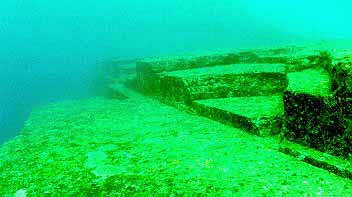 As a consequence of the scientific community’s reluctance to accept the site as a man made structure, the ruins have not been recognised by Japanese officials as a site of cultural importance, worthy of protection or further research. On 5th April 1998, a massive earthquake (measured at 7.7 on the Richter scale) hit the area around the pyramids – whether the underwater structures were damage or not is not clear. Unfortunately, until further studies are carried out on the structure, it will remain a site of speculation and contention. 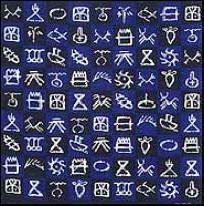 * Scientists / Historians - reluctant to accept any evidence which alters their current, widely accepted human timeline. * Those who are keen to promote the area as a tourist attraction. Any further information on this site would be gratefully received. Hancock has reportedly sold several million copies of his books touting earlier origins to civilization than is the general consensus. He believes that civilization rose about 17,000 years ago (rather than about 6,000) and vanished beneath a rising sea level, leaving its traces in flood myths in Sumerian and Vedic texts, in early maps of the Age of Discovery, and more plausibly, in submerged ruins. Hancock throws up a fantastic amount of data on these points in this work, ranging from his personal textual interpretations to his dives at coastal sites in Malta, India, Japan, and the Bahamas. Perhaps Hancock's what-if, adventuring style will again prove commercially successful, if not intellectually persuasive to archaeologists, but the poor organization of this work may daunt the otherwise enthusiastic. Discursive and speculative, it expands the meaning of open-minded and could have been pruned without harm (Hancock prints scads of his correspondence and interviews verbatim). However, rebels always attract attention--and Hancock has already proven that he can. Gilbert Taylor Copyright © American Library Association.